This Document Describes the differences between various models of Instrument Clusters fitted to the BA Series Falcons, Fairlanes, LTD's and GTs. The AUI series of Falcons brought with them two general models of Instrument Clusters that were fitted to the various models of these vehicles. Within these two models, there were three Backlighting colour variations, and three Background variations. This arrangement may sound somewhat confusing, but it allowed ford to make many Cluster variations, without using too many part variations. XT and Futura Clusters, using the Base Cluster, green backlighting, plain cluster surround, and plain instrument background. XR6, XR6 Turbo, XR8 Clusters, using the Base Cluster, blue backlighting, brushed cluster surround, and XR instrumentation background. Fairmont and Fairmont Ghia Clusters, using the high series cluster, White background, brushed cluster surround, and plain instrumentation background. Fairlane Ghia, Fairlane G220, LTD Clusters, using the high series cluster, blue background, brushed cluster surround, and plain instrumentation background. GT and GT-P Clusters, using the high series cluster, blue background, brushed cluster surround, and FPV instrument cluster background. NOTE : The XR series, GT and GT-P Cluster have a recalibrated speedometer with a maximum speed of 260Km/Hr instead of 220Km/Hr for all other clusters. The following instructions entail information for removing the BA Instrument Cluster from the vehicle. 1) Drop the steering column by pulling the steering column lever down, and adjusting the steering wheel. 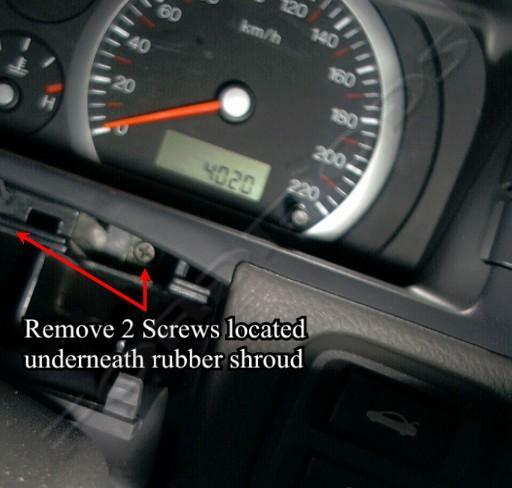 3) Remove the 2 screws hidden behind the Rubber shroud, holding the cluster in place. 4) Remove the 3 screws holding the top of the instrument cluster in place. 5) Disconnect the 2 wiring plugs from the back of the instrument cluster, and gently remove the instrument cluster from the vehicle. With the advent of the BA series of vehicles, the Electrical system has been revised to allow for complete use of the Bosch CAN BUS system. To put this simply, What this means is that in terms of wiring, each instrument cluster utilises the same electrical connectors, and will pull/feed the same sort of information on the vehicles BUS. Unfortunately though, there are some factors that you will need to keep in mind when swapping clusters around from different models. 1) The Traction Control Warning LED, and Speedo CAN Input needs to be configured via the WDS System. If enabled on a non Traction Control Equipped vehicle, the warning lamp will remain permanently on. This is required in order for the instrument cluster to determine if it should get its Speedo information from the Traction Control Module, or from the Power train Control Module on the CAN Bus. 2) High Series Clusters display the Trip Computer Information on the ICC Display, and not on the Instrument Cluster. 3) High Series Clusters do not have the trip computer button fitted, using instead dual backlighting dimmer buttons. 4) Door output warnings are obtained from the ICC, via the CAN BUS. All series falcons have all doors wired to the ICC, so utilising this feature does not require additional wiring. 5) There are a number of programmable modes available for all clusters, including Police Mode, odometer reading, etc. These Programmable modes are discussed later. 6) There is no Electrical, or Calibration Difference within the speedometer sections of the cluster, in terms of different Factory fitted Diffs, wheel, and Tyre Ratios. Changing Clusters will not alter the Factory speedometer readings. 7) Speedo Calibration settings are programmed via the WDS, and are set within the Vehicle Identification Block, held within the Power train Control Module, and NOT the Instrument Cluster. 8) It is not possible to use an XR/GT/GT-P Series Face, on a non XR/GT/GT-P Series Cluster ! This is due to the Maximum speed on the cluster face, which means that the speed increments are slightly compressed. The XR/GT/GT-P Series Cluster circuit board takes this compression in consideration when moving the speedometer needle, and as such, you would need to swap the complete cluster over to use the XR Face. As Information becomes available on swapping the BA Clusters, this information will be updated accordingly. At present, the only known method for changing the Odometer reading is by taking the cluster to an Authorised Ford Service Department, and requesting the new cluster to be re-programmed. Cluster Programming is achieved by using a Ford World Diagnostic System (WDS), by selecting the update Odometer value. The replacement clusters odometer will immediately be updated (+0/-1) and a permanent (un erasable) DTC will be set if the was set to a value greater than 100km. Note : If fitting a brand new Instrument Cluster, the Odometer Reading will be Zero. Unfortunately, it looks like changing the odometer reading on used clusters may be impossible until the EEPROM chip (If used) is discovered. The BA Instrument Clusters have a number of programmable modes which can be set using the Ford World Diagnostic System (WDS). Unfortunately, if you are considering swapping Instrument Clusters on a BA Falcon, you will probably need to have some of these features programmed for your cluster to function correctly with your vehicle. Vehicle Fuel Table to use - This setting is used to determine the Fuel Level Gauge Calibration, for using clusters in vehicles that have different sized Fuel Tanks. Valid settings include Unleaded, LPG, Sedan and Wagon tanks. Traction Control Fitted - This setting is used to determine where the cluster obtains it Speedo Readings. If Traction control is fitted, then the speedometer readings are obtained from the Traction control unit, via the CAN BUS. If traction control is not fitted, then the speedometer readings are obtained either from the speedometer sender, or via the ABS Module speedometer Output pin (If ABS is fitted) via the Power train Control Module. Police Mode Enabled - Unlike previous falcon models (EF-AU), there is no dedicated Police Cluster. The Police mode can be enabled on XT, Futura, and XR instrument clusters, but in doing so, some features and display information will be disabled, and other information will get shuffled around to make room for the Digital Speedo Information. The Odometer reset button is used to scroll between the Distance to Empty and the Tripmeter A Display in the Tacho Display area. The Speedo LCD panel will display "P" for Police mode, and the digital speed of the vehicle. The Trip Computer Button now functions as a Digital Speedo Freeze Button. Depressing this button whilst driving will freeze the digital speed reading. Holding this button down for a period of 3 seconds will restore the digital speed readings. Seatbelt Audible Reminder On/Off - This feature can also be changed by the vehicles owner. 2) Turn the Ignition switch to the On position, without starting the engine. The following information is transmitted via the CAN Bus by the Cluster, for use as Inputs to the various modules fitted to the vehicle. These signals are driven from inputs on the instrument cluster, and are consequently fed to the CAN Bus via the Instrument Cluster. The following information is received via the CAN Bus by the Cluster, from the various Inputs being feed to the various modules fitted to the vehicle. Information transmitted on the can bus to the cluster is not hard wired to the cluster itself, but rather transmitted from other electrical modules fitted to the vehicle. Document written by: Matti on 21 2004>, Copyright © 2007 Matti, all rights reserved.